It actually snowed here on Tuesday. You would never know that by looks of things today, but it did indeed snow. 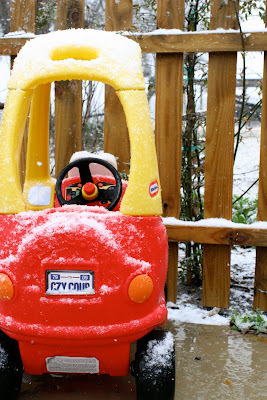 The best part about it was that the snow decided to stick around for a bit. 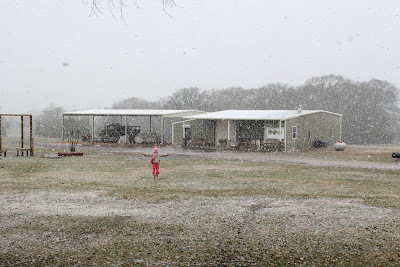 Craziness fell from the sky in the biggest bunches of snowflakes that these parts have seen. In the midst...that is our farm store in the background and an excited 5 year old in the foreground. 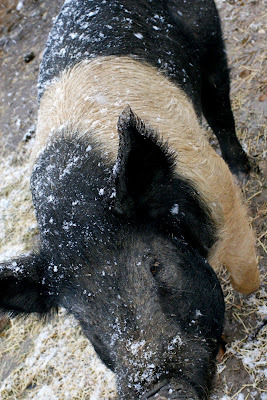 Dudley was our only pig out and about.....the rest were nestled snuggly in the barn with their babies. 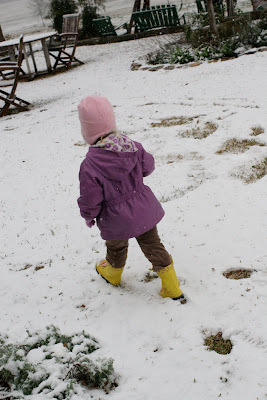 We had several hot chocolate breaks because, after all, it was SNOWING. 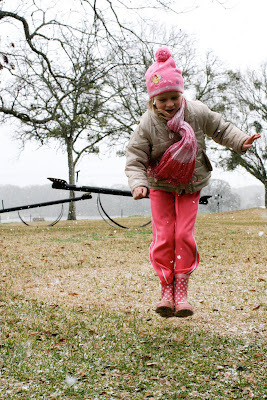 Laney Rae wasn't too thrilled with the snow. She wouldn't even pay me a glance at the camera. 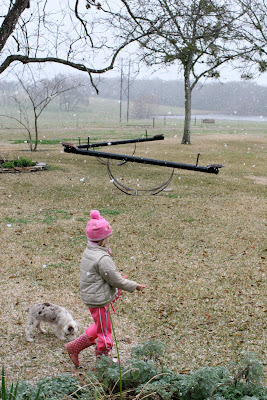 She woke up from her nap only to find that her surroundings were covered in "white tuff, momma." 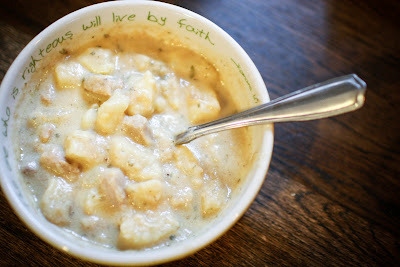 We had some stick-to-yo-bones Potato Soup....for the recipe GO HERE to our farm website. This is a favorite around here as of late. I'm not promising it's low cal- raw butter, raw milk, and raw sour cream make this dish delish! Ruthie is 9 months old today. Wow!! She is pretty much eating everything that is put in front of her. 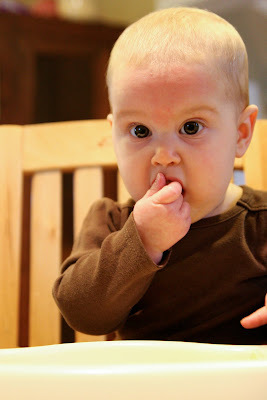 Ruthie has started feeding herself. Here's the little doll enjoying some raw milk cheese and bananas. I love all of my girls' mouths. They've all managed to come out with the same lips. Isn't this mouth just too much?? You've probably never had a moment like that. A few days ago I was outside working in the yard. Kaylyn and Laney Rae had came in the house to play while Ruthie was in her room taking a nap. I had the monitor on in the house and about every 10 minutes or so I'd open the door to see if I could hear the baby. I did this numerous times. 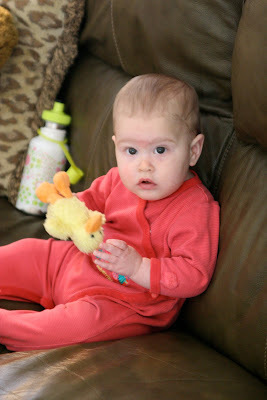 About the last 3 times of peaking in, I had noticed that Laney Rae was awfully quiet. I decided to take off my rubber boots and go look for her in the house. I walked in and towards the back of the house where the girls' bedrooms are. When I arrived to the hallway I heard the most adorable giggling from Laney Rae and Ruthie. My first thought was,"How sweet. Their having a sweet sister moment." But, my second thought was,"OH DEAR. Laney Rae alone with the baby is NEVER a good thing." I turned the corner into Ruthie's room. My second thought came full circle at that moment. Ruthie had been stripped NAKED and Laney Rae was sitting in her crib with her. They were both smiling at one another and having a big time! "Laney Rae, why is Ruthie naked?" I asked my 2 year old calmly who was beaming with pride. "Diaper and clothes wet momma," she explained back to me. 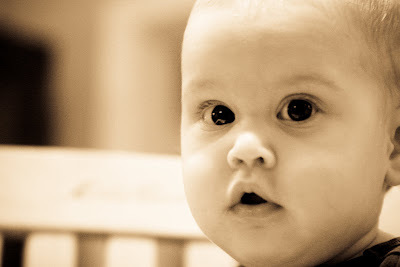 "Oh, her diaper leaked and you were trying to change her diaper?" "Yeah," in her cave woman laugh. If you know Rae Rae, you know what I'm talking about. At this point, I'm taking everything in and trying not to overreact or burst into laughter. After all, it was my fault. I notice that Laney Rae had gotten out an old package of newborn diapers, opened them, and had them scattered in the crib with them. I also noticed that Ruthie had a mohawk with some sort of goo textured and flowery fragrance in her hair. Upon further investigation, I found out that Laney Rae had rubbed sunscreen all over Ruthie's head- Laney Rae had taken it upon herself to also put "lotion" on the baby while she was changing her. At least it was "organic" sunscreen, right?? Laney Rae helped me give Ruthie a bath. I helped her finish changing Ruthie's diaper....wink, wink. Many of you know that our beloved Rowdy, farm dog extraordinaire, was hit by a car in November. We've been wanting another farm dog, but were waiting for the right one to come along. A man literally drove up our driveway and gave us our newest addition to the farm. Therefore, we assumed that this was indeed the "right one". Meet Max. Isn't he a cute little fella? 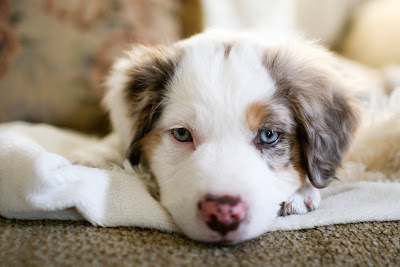 He is a 7 wk old Australian Shepherd. 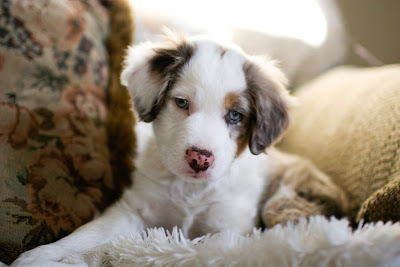 He has to be one of the smartest, calmest, and cutest puppies I've witnessed to date. The girls are smitten over him. I have to admit. I am too. He is quite fond of farm life and has received a total of 3 baths since he's been here- for a week. On one occasion, he was sprayed by a tom cat. Can we say GROSS??? On another occasion, he discovered mud. On the last occasion, he decided to eat pig poop. Have you smelled pig poop??? I feel like I have a newborn living in this house all over again. Puppies are hard work. But, oh so fun! 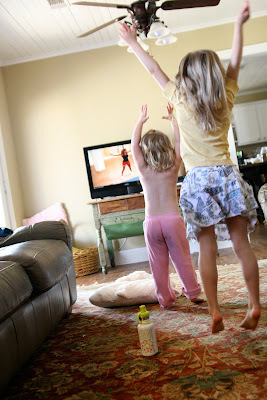 I snapped some photos of the girls doing Jillian Michael's Shred with me. I seriously had to capture the moment because they were so into it and too darn cute. I was seriously wishing I had stamina like a 2 year old and calves like a 5 year old as I took my place behind these two workout pros. 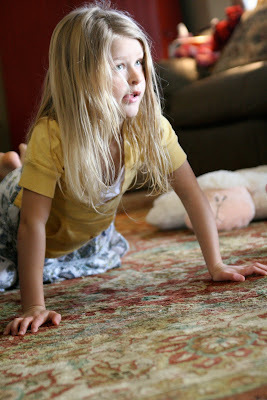 Laney Rae got out her "mat"....aka The Sheep Pillow. 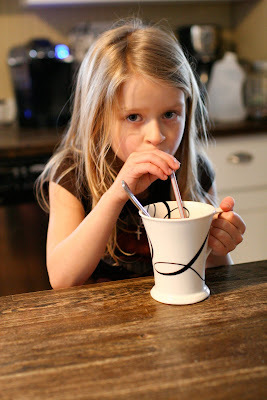 Kaylyn got out her water bottle...aka Raw Milk with some cocoa powder. Laney Rae decided she needed to work towards her abs of steel. But, first she had to loosen up by doing some knee circles. And more knee circles. Because can knee circles get any cuter than this? And so are hers. Kaylyn's tongue is what makes her push-ups extra perfect. Ruthie was quite entertained by watching all of her favorite people partake in all sorts of weird gyrations. Laney Rae has found that holding her cheeks really does the trick in helping her get through her crunches. 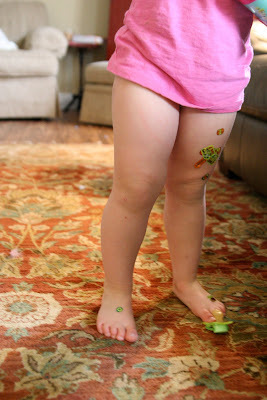 And when its all said and done, you get legs like this to adorn beautifully with stickers. Ha! Laney Rae's legs are seriously my most favorite part of her. They are absolutely squishy and wonderful! And this momma ended up getting no workout time in whatsoever because I just HAD to capture these two in all of their workout splendor. Excuses, excuses! I also think its pretty hilarious that Laney Rae is missing her shirt in the above photos, but missing her pants in the latter photo. This is typical around here. She is our free spirit. It's a monumental accomplishment if we even make it through the whole day with one stitch of clothing on at all. 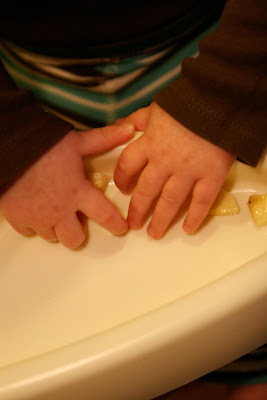 We once had a visit from a preacher during potty training. When I potty train my girls, I put long dresses with no underwear underneath. You may call it immodest, but I call it practical. Except, I do think I should have remembered to put some drawers on her before the preacher showed up. That, I regret. On a separate occasion we had a visit from the UPS man. Laney Rae ran to the sidewalk to greet him (when you live on the farm, the littlest things excite you). The UPS dude noticed that she wasn't wearing shoes outside. "Where are her shoes?" 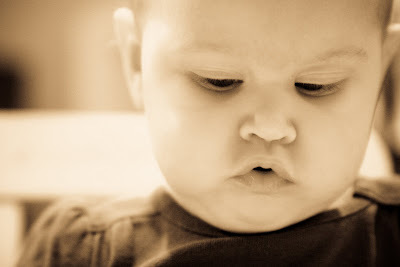 He asked in a confused voice looking at my baby girl's feet pressed up against the warm concrete. To which I explained,"You are just lucky she is wearing undies." I should not have said "undies" in the presence of a UPS dude. That, I regret. But, it was the truth. 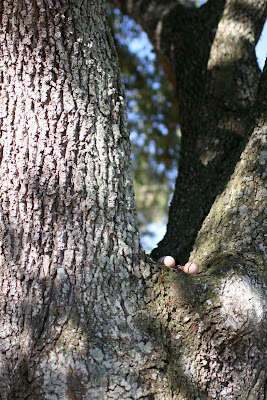 "Don't lay your eggs in a tree." Bad things can most definitely happen. 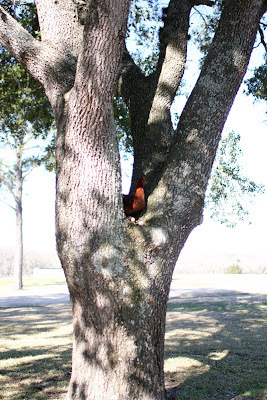 I looked out of the schoolroom window this morning and saw a chicken in our oak tree (see above photo). This sight alone sort of shocked me. And I'd like to draw your attention to those yolks. Yes, those beautifully vibrant orange yolks. I did not alter the coloring in any way in this photo. They are naturally that orange. 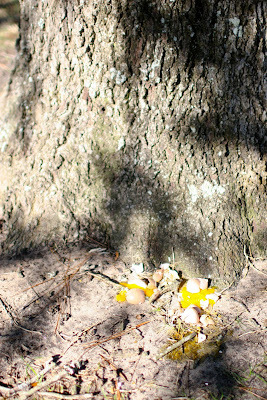 When you raise chickens on pasture, their yolks take on an orangish color. This is how you know if they've in fact been raised on grass. I use to think that egg yolks were yellow. But, in fact, they are orange- or at least should be. With all of the food labeling that is being done these days, things can get a little confusing. Did you know that the government owns the term "free-range" now? They bought this term so that farmers now have to pay big bucks in order to label their eggs using this terminology. 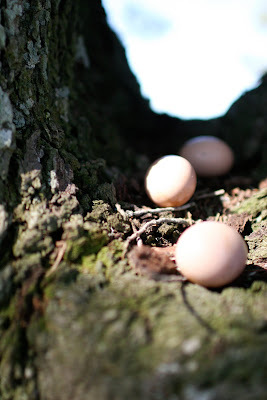 That is why we have to say that our eggs are "pastured". Not to be confused with "pasteurized". You'd be AMAZED at how many people call our farm asking to buy,"Some of them there PASTEURIZED eggs." I digress. Geez. Still trying to figure that one out. Not sure how one could pasteurize and egg if they so desired. I suppose then, that would be a hard boiled egg that would need a good shellin'. Okay, sorry, back on task here. But, what is even more troubling is the way that the government has defined what "free-range" even means. Baloney. They’re trying to duck the issue by incorrectly defining “true free-range.” And the USDA isn’t helping consumers learn the truth, either: “Allowed access to the outside” is how the USDA defines “free-range.” This inadequate definition means that producers can, and do, label their eggs as “free-range” even if all they do is leave little doors open on their giant sheds, regardless of whether the birds ever learn to go outside, and regardless of whether there is good pasture or just bare dirt or concrete outside those doors!" 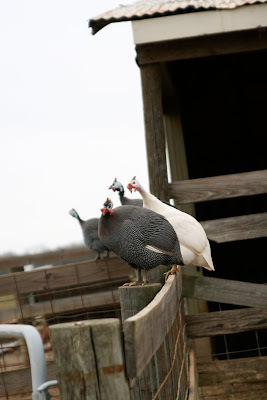 We say this all of the time around the farm, but farmers can't imitate a chicken raised on pasture. They can try and stick whatever "free-range" label you want on the carton, but the proof is in the yolk. If you've been reading this blog for a while, you might remember this photo I snapped in May of 2008. Just typing that gives me chills. Mainly because May of 08 feels like yesterday. I came across this photo yesterday as I was getting things together for a magazine article about our farm and family that will hit the stands in March. I wanted to re-post this photo because it does me some good on a cold day like today. 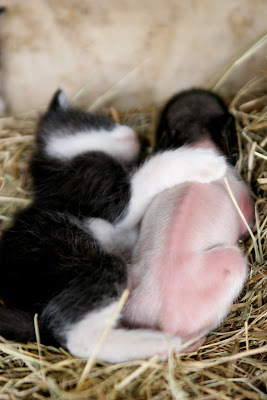 I caught this piglet and kitten taking a nap together on a warm summer's day. Can't you just feel the warmth of the sun pressing against your face? Or smell the watermelon and basil? Or hear the green leaves blowing in the trees? Oh, summer, how I long for thee. I got this recipe from Tammy's Recipes. There are a lot of great recipes on this site all made from scratch. I have to modify some ingredients, but overall I thoroughly love browsing through a lot of her recipes. If you are ever in a "what in tarnation do I fix for dinner??" rut, check her out. The website is filled with lots of wonderful menu ideas. There is even a recipe on how to make your own "Cream of Chicken Soup" so you don't have to buy the canned stuff. I've tried it in various casseroles when I can slip a casserole by Farmer J and the soup has turned out wonderfully. 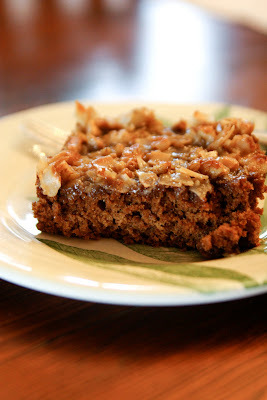 Here is the recipe for the yummy spice cake. I honestly don't like molasses too much. But, it tastes good in this cake. I substituted the flour for 100% whole wheat flour and it was still really moist and yummy! 1. Measure all cake ingredients into a large mixing bowl. Blend 1/2 minute on low speed, and then for 3 minutes on high. 2. Pour batter into a greased 9 x 13 baking pan. Bake at 350 degrees for 35-40 minutes or until cake tests done. Cool cake slightly. 3. To make coconut topping, melt butter in sauce pan. Add brown sugar and stir over medium heat until sugar is mostly dissolved. Add coconut, pecans, and cream. Spread topping over cake and broil cake for 2-3 minutes, until topping is bubbly and browned. I haven't posted about life on the farm in a long time....it's been fast and furious around here but in the most wonderful way imaginable. The Lord's favor has fallen on our farm. That is the only way to explain the amount of growth we are experiencing. Last night we were out in the farm store filling orders and realized that we are just about plum out of everything- even things we typically always have like pork chops. We were all overcome with thankfulness as we stood there glancing into our empty freezers. Never once did we think last year that we would be where we stand today. God gets all the glory for this. We've not done anything to gain this and certainly don't have a "marketing strategy" in place. 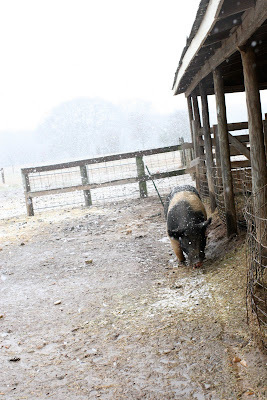 Here are some scenes from around the farm. Despite the coldness of winter, things seem to be fairing alright around here. 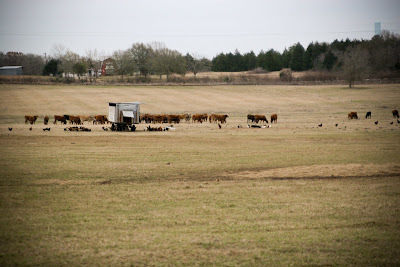 The cows and chickens remain one big happy family out in the pasture. 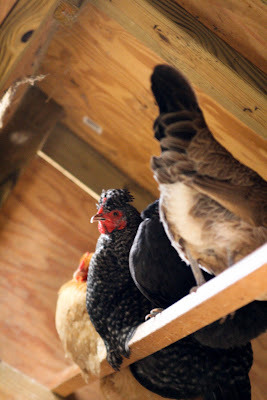 We follow our cows with our chickens to sort of "clean things up", if you will. Chickens scavenge through cow manure eating insects and broadcast their poo throughout the pasture. Both of these animals put good things back into the soil by fertilizing it with their manure. The Guinea fowl are still as loud as ever. They are considered the alarm system of the farm. Have you ever heard a flock of disturbed guineas? The speckled guinea drop the most beautiful feathers. Our laying hens have been tolerating the cold pretty well. On the coldest of days, they stay hunkered down inside their coop, but have the option to roam and forage in the grass if they so desired. 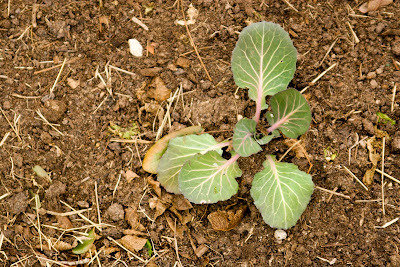 Cabbage is still growing.......we re-planted after the freeze wiped all of our cabbage out. 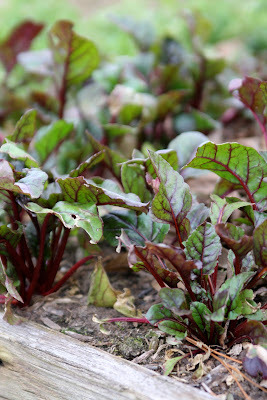 The swiss chard is looking pretty.......because honestly, that is all its good for to me. I don't really enjoy eating it, but it makes my garden look good. 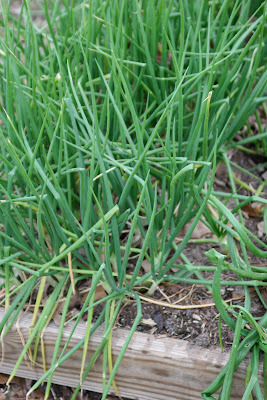 Our shallots turned out well too. We lost a whole lot in the freeze including broccoli, brussell sprouts, potatoes, and cauliflower. I wasn't too thrilled about loosing all of this. 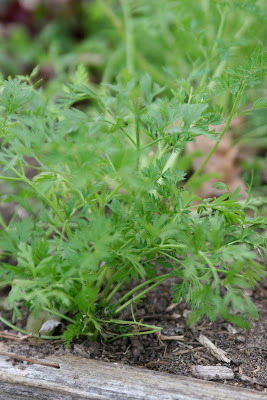 Our Spring garden is in the process of being re-vamped so that gives me something to look forward too.